Audi dealers, riding a sales bonanza, are also in the throes of a $1 billion building boom as they prepare to fulfill the brand's long-term goal of selling 200,000 vehicles a year in the U.S. In Orlando, Audi sales are up 86 percent, the company says, since AutoNation Inc., the top-selling U.S. dealership group, opened its $21 million Audi South Orlando dealership in April. 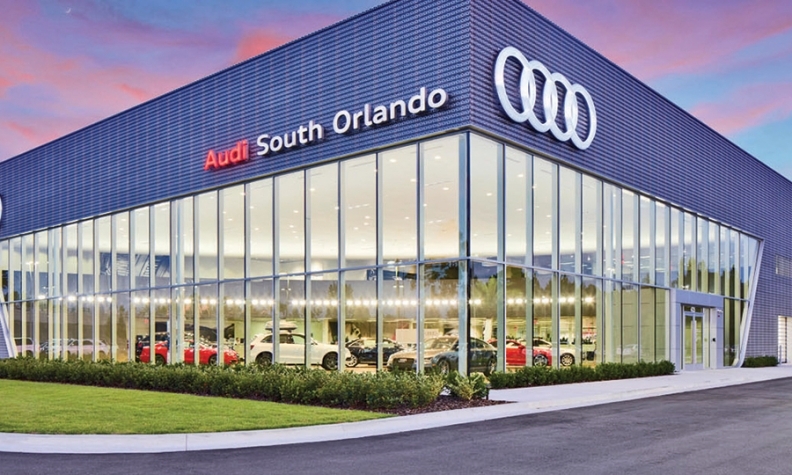 The store grabbed the territory previously held by Holler-Classic Automotive Group, which moved its operation to a new, larger store on the city's north side last year and named it Audi North Orlando. In Texas, megadealer Carl Sewell more than tripled sales since acquiring Audi North Houston in 2010. Now he is set to begin building a second, four-story Audi store -- 275,000 square feet of space, including parking -- in Sugar Land, south of Houston. The new dealership, opening next fall, will cost "north of $25 million" to build and generate estimated sales of about 200 new vehicles a month by 2017, Sewell said. "The expectation for the market is high," he said. "We are very optimistic about the future of Audi." More than 100 of Audi's roughly 280 U.S. dealerships are in some stage of a major construction project, says Scott Keogh, president of Audi of America. By year end, 26 Audi dealerships will meet Audi's new design standard, known as Terminal. Another 30 Terminal dealerships are scheduled to be built in 2015, and 45 were completed through 2013, according to Audi. Audi says sales in Orlando are up 86 percent since AutoNation opened Audi South Orlando. Combined, the projects represent roughly $1 billion in dealer investment, Audi says. And they reflect a hot streak that is propelling Audi to new heights and into new markets. Audi's U.S. sales this year were up 15 percent through September, nearly double the 8 percent sales increase in U.S. luxury vehicle sales overall. Much of Audi's growth is coming from the redesigned A3 compact sedan, which went on sale in April and is attracting large numbers of first-time Audi buyers. "We didn't want to introduce these new consumers to a world that wasn't ready for them," Keogh said of the dealerships. "Now the world is ready for them. We have big enough facilities that are properly invested, properly scaled, modern and new." Meanwhile, Audi is adding a limited number of new dealerships, primarily in the South, where the brand is underrepresented, Keogh says. High-profile dealers and groups such as Sewell, AutoNation and Hendrick Automotive Group have all been awarded new Audi points in the past year, and the Audi franchise is in high demand among retailers hunting for acquisitions. Keogh says the expansions and new Audi points are needed to increase the network's fixed-operations capacity for the influx of new customers and to support Audi's higher-volume aspirations down the road. The brand has set a target of 200,000 U.S. sales a year by 2018. "It comes down to capacity," Keogh said. "We've been on a crusade to increase capacity to prepare our dealers for this growth." Rick Hendrick, chairman of Hendrick Automotive, credits Audi for adding dealerships only where they're needed. Charlotte, N.C., for example, had just one Audi store before Hendrick opened Audi Northlake in April. Audi says sales in Charlotte have grown nearly 88 percent since. "They could ramp it up a lot," Hendrick said, "but they've been very slow and steady in the markets and made sure they have enough product to take care of the dealers they already have." Keogh doesn't expect to add many more dealerships. Instead, his priority is further growth in sales and profitability at existing stores. The average Audi dealership already earns a gross profit of 3 percent of sales. "What we do want are bigger facilities, increased throughput and increased profitability for these dealers who invest," Keogh said. "The same dealerships that got us to 100,000 units will be the same ones who get us to 200,000." In the first nine months of this year, Audi sold 130,983 vehicles in the U.S., making it the market's fourth-largest luxury brand, with a 9.7 percent share of luxury vehicle sales. Just eight years ago, Audi ranked No. 9 with a share about half that. Much of the growth over that period has come from an infusion of new products, including crossovers and high-performance variants. The Q5 crossover launched in 2009 is now the brand's top-selling vehicle. Audi also launched high-line products such as the A7 four-door coupe and R8 sports car to generate excitement. Such high-line vehicles "establish a significant part of your brand value," Sewell said. Meanwhile, the A3 compact is off to a hot start, selling 13,806 units since it went on sale in April. As of mid-September, conquest sales to nonluxury owners accounted for nearly 80 percent of those sales, Keogh says. That was a pleasant surprise, Keogh said. He anticipated such conquest rates after two years of A3 sales, with the first six months of sales going "heavily" to existing Audi owners.